The term ‘Post-80s’ has been talked of too much, excessively , and so now we would speak for ourselves , not with text but with images , post-80s in the eyes of post-80s . We grow up in an interesting era. With the advent of digital photography, almost every post-80 has a camera of his/her own. Phototaking is no longer something reserved for festivities, nor is it the privileged activity of the professional photographer. One can take a photo just by clicking at one’s mobile phone. 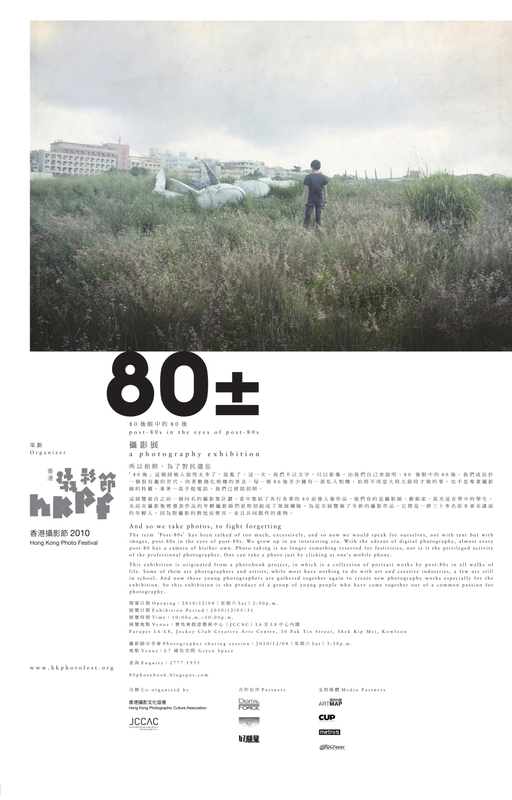 This exhibition originated from a photobook project, in which is a collection of portrait works by post-80s in all walks of life. Some of them are photographers and artists, while most have nothing to do with art and creative industries, a few are still in school. And now these young photographers are gathered together again to create new photography works especially for the exhibition. So this exhibition is the product of a group of young people who have come together out of a common passion for photography. 開幕日期 Opening ：2010 / 12 / 04 （ 星期六Sat ） 2:00p.m. 展覽時間 Time ：10:00 a.m . – 10:00p.m. 攝影師分享會 Photographer sharing session ： 2010 / 12 / 04 （ 星期六Sat ） 3:30p.m.